5 April, 1922: Panditha Ramabhai (b.23Apr.1858) was an eminent Indian Christian social reformer and activist. She was a poet, scholar, and a champion of improvement in the plight of Indian women. As a social reformer, she championed the cause of emancipation of Indian women. A widely travelled lady, she visited most parts of India, and even went to England and the U.S. Her father was Anant Shastri Dongre, a scholar of Sanskrit, and her mother was Lakshmibai. They were a Chitpawan Brahmin couple. Her father taught her Puranic Sanskrit and she made quite a name for herself as a scholar in Puranic circles. She acquired great reputation as a Sanskrit Scholar. Fluent in seven languages, she translated the Bible into Marathi, her mother tongue. Deeply impressed with her knowledge and ability, Sanskrit scholars, at the Calcutta University, conferred on her the titles “Saraswati” and “Pandita”. Although she was a Brahmin, she married (13th Nov.1880) Babu Bipin Behari Madhavi, a Bengali lawyer at Bankipore (Patna, Bihar), who was not a Brahmin, and this created a stir in the orthodox circles of Hindu society. Bereft after her husband’s death shortly thereafter, she found herself unable to play the role traditionally reserved for upper-caste Hindu widows, and converted to Christianity, an action which created a scandal even in liberal Calcutta society. She was given a scholarship to study medicine in England; when she arrived there, she found that her hearing was defective and so she could not participate in lectures. While in England, she wrote the feminist classic “The High Caste Hindu Woman”, a scathing attack on traditional practices including widowhood, polygamy and child marriage. She established the Mukti Mission in 1889 as a refuge for young widows who were abused by their families. In Marathi, her native tongue, the word ‘mukti’ means liberation. The Pandita Ramabai Mukti Mission is still active today, providing housing, education, vocational training, and medical services, for many needy groups including widows, orphans, and the blind. Mukti Mission is located near the city of Pune (Poona) and receives support from several foreign countries including the United States and Australia. In 1919, the King of England conferred on her the Kaiser-i-Hind award, one of the highest awards an Indian could receive during the period of the British Raj. Her contributions as a builder of modern India were recognized by the Government of India by issuing a commemorative postal stamp on 26th Oct 1989 in honour of her. The work of Pandita Ramabai continues today as a tribute to the Saviour whom she faithfully followed, Jesus Christ. 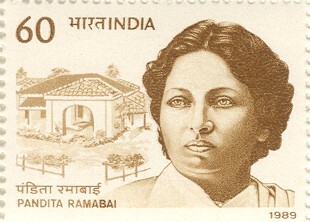 26 October 1989, in recognition of Pandita Ramabai’s contribution to the advancement of Indian women, the Government of India issued a commemorative stamp.